The barleycorn appears in the post Roman metrology of the British Isles as the progenitor of the Statute system of metrology. As a cereal, it is both a wild and introduced species. But, why do the learned and technical papers regarding the origins of the Statute measure ignore its contribution to the system. It has a history of its own. Three barleycorns dry and round make an inch; 12 inches a foot, and 3feet a yard. In the fertile crescent of the middle and near East, modern Syria, Jordan and Iraq, c8000 BCE, the wild grasses gradually transformed. A genetic accident occurred. The original wild Wheat inter pollinated with Goat grass to form a hybrid which was fertile, and then, a second Goat Grass cross pollinated to form Bread Wheat. Nature provided the raison d’etre for farmers. 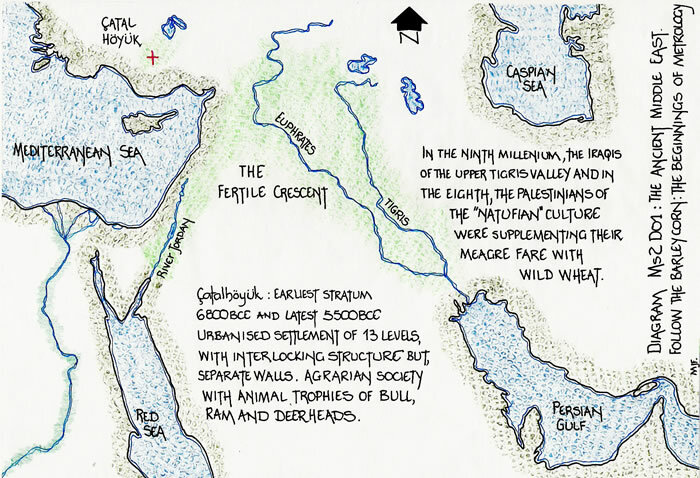 Dating of flint sickles and grinding stones, querns, discovered in these areas indicate that the population had probably been collectors of wild grain. By c6750BCE, seeds of Wheat and Barley are found; Bread Wheat and Wild Barley. In the near East, c5750BCE, we find Cattle and Emmer Wheat, Einkorn, Barley, 6-row hulled Barley, Oat, Peas, Lentil, Vetch, Pistachio, Acorn and Olive. In Egypt, c4200BCE, there is Emmer Wheat and 6-row hulled Barley. The British Isles in the same period, c8000BCE – c4000BCE, is a very different landscape. It is changing from an Ice Age climate of frozen soils, post glacial, then maturing soils, and, finally productive soils. By c6000BC Britain is an island and the southern parts have trees and grasses, whereas the north is still changing slowly to forested areas as the perma-frost melts and soil rehabilitates. 8500BCE The sea level is 100 feet (30 metres) below the present level. Then by 2500BCE, at Windmill Hill Wessex, we find there are people who cultivate patches of soil using no more than digging sticks to grow primitive species of Wheat and Barley. In the early Bronze Age c2000BCE, the Beaker Peoples, so named for their distinctive beakers, a well fired and fairly thin walled clay ware, were probably using them to drink a Barley based concoction. By the 17th/14th C, BCE, Wessex is the home of rich and powerful mercantile aristocracies, who traded as far as Greece, Iberia and the Baltic. Much later in the time frame, as on the continent, the advent of Iron Axes c7thC onwards, meant that forest could be cleared more readily. This led to the rapid opening up of large tracts of land in south Britain. The trees gave way to cereals. At the end of the Bronze Age, we note that Spelt (German Wheat), a particularly hardy form, is introduced, and, a new hardy type of Barley, which is the hulled variety instead of the primitive naked variety. This simple change enabled a crop to be sown in autumn and harvested before the spring sown variety, thus allowing Roman commentators to remark upon the double crop fact. Therefore we have a time frame for the ubiquitous BARLEY CORN. We also have the information to deduce the means of its arrival to these shores. For this period was when the Mediterranean and Atlantic seabord were united in a common cultural inheritance, dependent upon intensive maritime activity. By the beginning of the 8th c. BCE, the Phoenicians had established trading posts along the Iberian Peninsula. Gradually this extended northwards along the Portuguese coast, past Cape Finisterre to the Bay of Biscay, and via the Gironde Estuary, Bordeaux, northwards around Brittany to Britain and the source of Tin. This source had been known for perhaps a millennium or more. The Beaker Peoples of the Early Bronze Age, c2000BCE, had traded across to Ireland, which had no Tin, but produced Bronze artefacts. However, Ireland did have Gold in the gravel beds of the Wicklow Mountains. The Beaker People were merely continuing a trade commenced in the Megalithic period. This trade was across Europe, as the excavated artefacts show. The trade from the Mediterranean would have continued until the Carthaginian blockade c6th c BCE, of the Straits of Gibraltar. From then an overland route, Marseille, Narbonne, the Carcassonne gap, the River Garonne to the Gironde Estuary at Bordeaux, and thence the same sea route around Brittany to Cornwall. Thus the trade did not stop, and the transfer of ideas, the necessity for exchange rates and transfer even inadvertently of crops and animals would have occurred. This is at the beginnings of our Iron Age, when we see a huge change in Europe of peoples, culture and trade. Fundamental to the English Statute System, English metrology, is the supposed average weight and length of a barleycorn from the middle of the ear. This Barleycorn, not the primitive variety, appears to have arrived during the major expansion of trade, around 1700BCE/700BCE; nearer the 700BCE time frame. It is a cereal from the Near East, via Egypt and Greece, and their ancient metrology indicates the growth and route of its transfer. But, it did not only migrate west, it was traded east at the same time. 3 grains of Rice = 1 Finger and 24 Fingers = 1 Coudee or Cubit. 1 raja or particle of dust is the basis of the whole system. 25 nalva = 1 Krosa. Having moved from the near east to India, we can now travel as far as is possible west in Europe to Portugal. Here we find “Le Dedo” ( finger), one eighth of a foot, which is equal to 4 Graos or grains of Barley , again laid side by side. 12 pollegadas = 18 Dedos = 72 Graos. Le Palmo de Craveira = 8 pollegadas = 12 Dedos = 48 Graos, or grains of Barley. Therefore the Grao or Barleycorn is 1/72nd of the Portuguese foot. 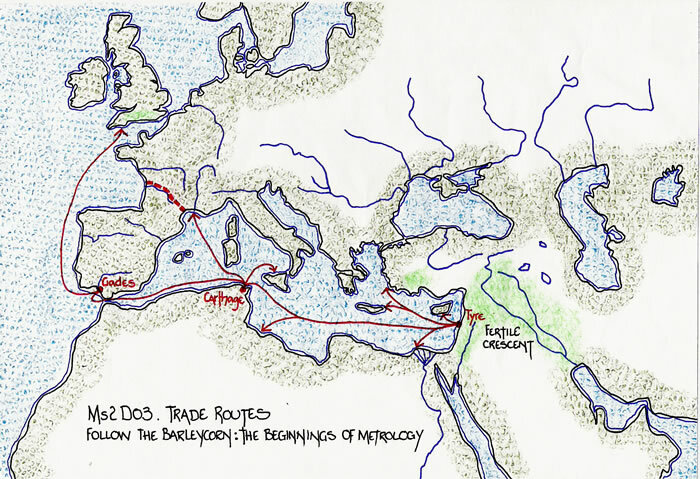 Thus we can state that it is possible to establish, by following the maritime trade routes from the Near East, that the Barleycorn spread in both easterly and westerly directions as a linear measure; from the fertile crescent of Mesopotamia, to India and Britain. The Barleycorn, as a weight, may be followed on its journey from the Near East to India and Britain, in parallel to the Barleycorn as a unit of measure. One may comment that this is quite logical, and, could indicate a homogenous system of metrology. But, there must be items requiring such delicate weights, for a system. “I will explain, leaving nothing out, the names of (the weights of) copper, silver, and Gold that people normally use to do business on earth. Here the ‘berry’ is also the bright red seed of the ‘Gunja Berry’, Abrus Precatorius. The ‘Laws of Manu’ are in fact a description of the fines levied for various malfeasances, and, there is a curious co-relation to early British law. The 10th C Venedotian Code of Dyvnwal includes the barleycorn, as does the 14thC English law, where the inch is defined as “three grains of barley, dry and round, placed end to end lengthwise”. In the Plantagenet period, the pennyweight was described as the weight of 32 (average) wheatcorns (seeds). Thus we have another link to gold weight, the Carat. It was originally the seed of the Carob plant (Ceratinia Siliqua) and in the early middle ages it equalled the weight of 3 barleycorns or 4 wheat grains; but was later equated with the weight of 4 grains. 1lb Tower = 5400 Grains; 1 Libra Mercatoria = 7200 Grains. Thus from the Near east c6000BCE when Barley became a cereal plant capable of being used for food, animal fodder and a beer, to 1000CE and some 4000 miles distance, we have evidence for a continuity of usage. But, used as a metrological tool, not just a foodstuff. In recent times, checks were carried out on the efficacy of the Barleycorn as a weight and measure. To establish a length check, 45 Barleycorns were shown to equal 15 inches without discernable error, and the average for the Carat was also correct. Why therefore in all metrological treatises, do those authors ignore the fundamental measure of the Statute System of England? The fundamental basis for the Statute System of England, and the measures of Wales and Scotland, is the Barleycorn. It is the Grain of an imported variety, not of an indigenous species. The Barley, the more robust ‘hulled variety’, has multiple seed rows. Thus there is a choice of seed to be utilised. This new Barley was found to have a constancy, which when taken from the middle of the Ear, could be used to determine both measure and weight. When the then developed world, the Near East and Middle East expanded and traded with the eastern and western extremes of their world, they transferred their metrologies. This was based upon the Barleycorn and hence it is the basis of many metrologies throughout the world. Sachau, E. (1910) Chronology of Ancient Nations; Al Biruni’s India, p160>, London. Grierson, P.(1971) English Linear Measures. University of Reading Stenton Lecture. Connor, R D.(1987,) The Weights and Measures of England, Science Museum. Berriman, A E. (1953) Historical Metrology. J M Dent & Sons Ltd. London. 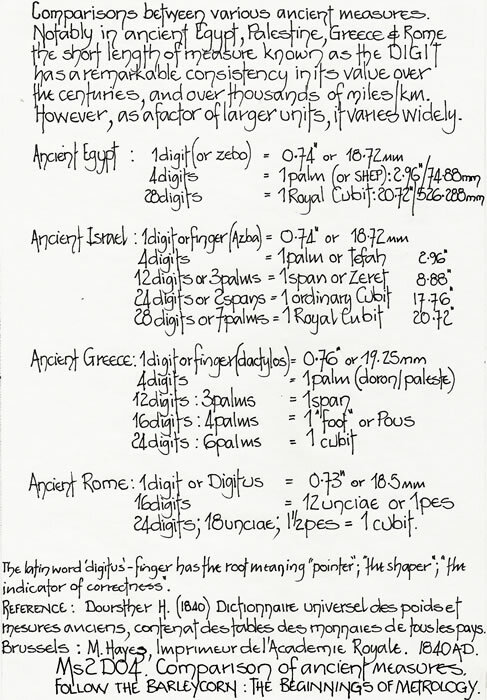 Zupko, R E. (1977,) British Weights and Measures. Univ. of Wisconsin Press. Owen, A. (1841,) Ancient Laws and Institutes of Wales, Venedotian Code, London. Bowen, E G. (1972) Britain and its Western seaways. Thames and Hudson, London. Doursther, H. (1840) Dictionnaire des Poids et Mesures. Bruxelles. Ferrar MJ & Richardson A. The Roman Survey of Britain. BAR , 359, 2003.